Chosen by the American Library Association’s Booklist as one of the top ten religious books for children in 2002. What did Jesus really say and do? How does it relate to you today? Bestselling author Stephen Mitchell has spent years thinking about spiritual issues exactly like these. Here, in a book based on his own The Gospel According to Jesus, is a simple, clear, and deeply insightful presentation of the life and teachings of Jesus that makes them real as never before. This is a remarkable book that will be widely read, not only by the teenagers it is addressed to, but also by adults. Mr. Mitchell begins by candidly describing his own unorthodox, inspiring journey to an appreciation of the teachings of Jesus. Then, as he did in his popular The Gospel According to Jesus, he uses his own translation of the original texts to follow the life story of the great teacher and explore his inspired teachings. Finally, he talks to teens about how these teachings can lead them on their own spiritual path. You may be familiar with some of Jesus’ words. This remarkable book will help give those words new meaning for you. Jesus once or twice referred to himself as a prophet. But he never thought of himself as the Messiah or as the son of God. True, he called God Father, but that was (and is) common in Jewish prayer. He didn’t mean that he was literally a son of God. He knew that he had a human father. He didn’t think that a male God had come down from the sky and impregnated a human female, who had then given birth to a hero, as in Greek and Roman mythology. What he meant by a son of God was someone who takes after God, just as a son takes after his father. If you truly love God, and treat your fellow human beings with respect and compassion, then you are a son of God. “Blessed are the peacemakers,” Jesus once said, “for they will be called sons of God.” “Love your enemies, do good to those who hate you, bless those who curse you, and pray for those who mistreat you, so that you may be sons of your Father in heaven.” In other words, the more you are like God, the more you are a son of God or a daughter of God. Jesus knew that he was not the only son of God. In fact he wanted everyone to become a son of God. However poor or stupid or ugly or confused we think we are, all of us are capable of becoming sons or daughters of God. Anyone who acts with unselfish love is God’s beloved child. It is equally true that everyone is God’s beloved child and that God’s love is always present for us, no matter how selfishly we act. Sixty years before Jesus was born, the Romans had conquered the whole region of what is now known as Israel. Over Jesus’ lifetime, this region was divided into three separate countries, each with its own government. These Jewish governments under the Romans were semi-independent. In Judea (where Jerusalem is located) there was a Roman governor, but the day-to-day administration was left in the hands of prominent Jewish citizens. In Galilee, where Jesus lived, the ruler, Herod Antipas, had to pay an annual tribute to Rome. He also had to support Roman policies and military actions and maintain public order in his territory. In return, the Romans protected him from invasion by other countries. The rulers had to be very careful, though. The slightest sign of political upheaval seemed dangerous to them. (More than thirty years after Jesus’ death, there was in fact a widespread revolt, which the Romans suppressed with their usual efficiency and ruthlessness; this revolt ended in the destruction of the Temple in the year 70.) Any popular, charismatic preacher was a potential threat. That is why, at the beginning of Jesus’ career, Herod Antipas had John the Baptist arrested and executed; he thought that John was creating a political disturbance. And that is probably why Jesus himself was killed. The fact is that we know nothing about Jesus’ birth and childhood. We know hardly anything about his life before the age of thirty, except that he was a carpenter from the little town of Nazareth in Galilee, to the north of Judea. He was probably born around 4 B.C.E. (Before the Common Era). Some scholars think that he was an illegitimate child — though of course in God’s eyes all children are legitimate. His mother’s name was Miriam (Mary in English), and he had four brothers — Jacob, Joseph, Judah, and Simon — and at least two sisters. That is all we know. Jesus himself said nothing about his early life. He was probably poor. Chances are that he learned carpentry from his father (whose name, according to the Christmas legends, was Joseph); trades like this were usually hereditary in the ancient world. But our word carpenter is narrower than the corresponding words in Greek and Aramaic, which included such occupations as builder in stone and worker in metal. In all likelihood, as a young man Jesus earned his living building and repairing houses and making farm tools, house parts, and furniture. It is important to understand that his being a carpenter didn’t mean that he was uneducated. The level of literacy among Jews at this time was high. It is clear that Jesus’ knowledge of the Hebrew Bible was extensive. Though he wasn’t a professional scholar, he was a brilliant teacher and more than able to hold his own in debates with learned men. The first incident in Jesus’ life that we know of is his baptism. At about the age of thirty, Jesus became a disciple of a desert prophet named John the Baptist, who appeared in Judea. John had lived for many years alone in the wilderness, fasting and praying. He had eaten the food of the wilderness: locusts and wild honey. According to the Gospel stories, he dressed in camel’s hair, with a belt of animal hide around his waist. His eyes glowed, and he spoke with ferocious intensity. John said that if Jews confessed their sins and washed themselves clean, God would forgive them, and the whole country would be purified. He said that the world as people knew it was coming to an end. He said that God would soon send his Messiah, a descendant of the great king David, who would lead Jews to victory over the Romans and who would then rule in peace over the land of Israel. People from all over Israel came to see and hear John. They confessed their sins, and they were washed and blessed by him in the Jordan River. It’s probable that many of them felt their spirits renewed. As Jesus emerged from the water, he had the kind of experience that is called enlightenment or awakening. Other great teachers throughout history — the Buddha, for example, and Lao-tzu, and the great Sufi and Zen masters — have woken up to reality in the same way. Even today, it is possible to undergo such a profound, life-changing transformation. I am not talking about the usual “born-again” experience, in which people accept the beliefs of fundamentalist Christianity. I am talking about an experience deeper than any belief. We don’t know what actually happened to Jesus during his baptism. But here is my sense of it. This was a much deeper experience of God than John the Baptist had had. Although Jesus must have been grateful to John, he must have realized, in the weeks and months after his experience, how limited John’s teachings were. He must also have realized that for anyone who truly understands, the Messiah has already come. In other words, anyone who stands in God’s presence all the time knows that God’s kingdom has already arrived. After his awakening, Jesus went out into the wilderness. He stayed there for many weeks, alone, letting his great experience settle and deepen. There are legends about his time in the wilderness, but again we have no direct account from Jesus himself. When he came back from the wilderness, he learned that John had been killed by Herod Antipas, for stirring up unrest among the people. This may seem to you like a very risky way to live. It requires being without any external security at all, knowing with certainty that whatever happens is good. But people who live this way don’t need anything from the outside. They see the ordinary way of living as risky, since it depends on externals that can never give us real happiness or peace. Jesus is telling the literal truth here. When you trust God completely, everything that happens is a gift. ALA Booklist top ten religious books for children for 2002. Here’s a book for teens with a different take on Christianity, boldly stated and without apology to the majority viewpoint. An easily understood, thought-provoking journey through the Gospels. 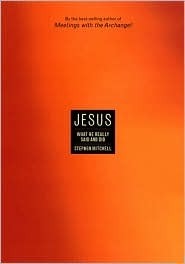 Mitchell taps into the questions of truth and faith so central to adolescence. He models for readers the tools with which to begin an examination of their own beliefs and encourages seekers along their own paths.